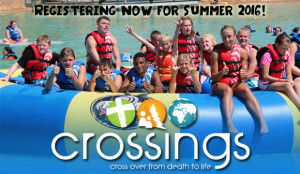 All current 6th-8th graders are encouraged to join us for camp at Crossings in Bagdad, KY. Students will have 5 days packed with lake activities, zip lines, bazooka ball, free time, worship, and bible studies. This is an important week for our middle school students to grow in their relationship with the Lord and to grow with other students from our church. This year’s focus at camp is helping students discern what it means for their identity to be found in Christ.